Miguel Peña was born February 20, 1987, at Hialeah Hospital. He is a graduate of Hialeah Miami Lakes Senior High School and went on to study Elementary Education at Florida International University. 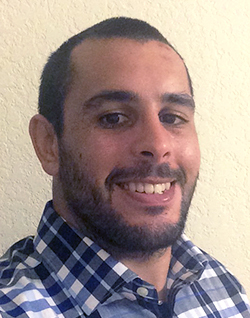 Prior to joining E-SToPP, he served as a Community Liaison Specialist with Project MPACT in Miami Gardens. He has been with E-SToPP since 2013 and together with Dr. Debra Pane and Wayne Rawlins, he helps facilitate the Positive Peer Leadership Mentoring Program at the Miami Dade Regional Juvenile Detention Center and Turner Guilford Knight Correctional Center. Pane, D. M., Whitehead, C. L., Peña, M., & Bartley, C. (2014, March). Discerning, interpreting, and transforming the impact of mass incarceration on Black families and communities. Presented at the 38thannual National Council of Black Studies (NCBS) Conference. Miami, FL. Miguel Peña was a nominee for the 2015 Miami Chamber of Commerce HYPE Difference Maker award. Miguel is currently working to engage Miami-Dade communities in the commitment to Eradicate the School-to-Prison Pipeline. He lives in Hialeah, FL.